I try to make heart doily pancakes. And now I try to make stuffed bell peppers. It's a goal of mine to work more vegetables into our meals. I also have a strange interest in stuffed foods. So stuffed peppers was an obvious choice! You can see what I was going for in the picture above. And here is how they actually turned out. In my defense, my 3-year-old "helped" with the ketchup! 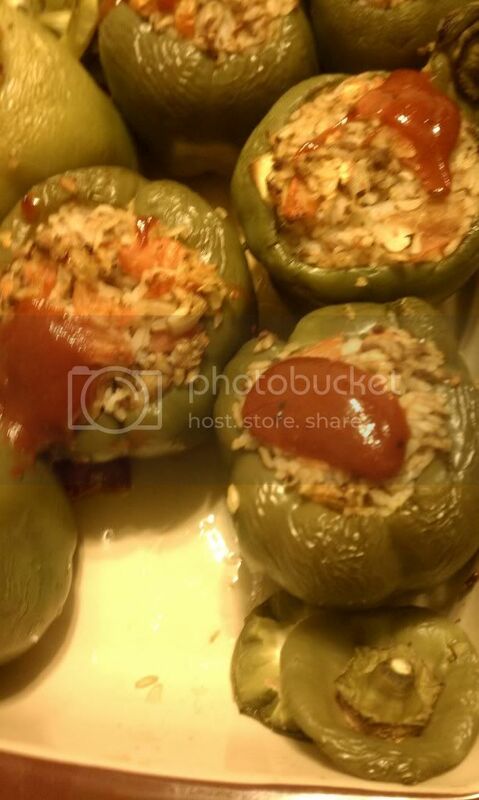 The stuffed peppers tasted pretty good and were fun to eat. You can see the recipe that I followed here at Simplyrecipes.com. If you follow this recipe, I would recommend that you skip the blanching step. The peppers are already brilliantly colored and they cook just fine in the oven, with how long you have to have them in there to get the hamburger cooked! Next time I may also try cooking the meat before stuffing the peppers, although I worry that that would ruin the meatloaf texture inside. I'm already "cooking up" ideas on how to do a tasty vegetarian version--I'm thinking a great vegetarian alternative would be mashed black beans and rice. I'll post again when I give that a try!